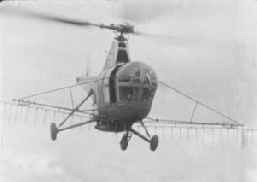 Other features are currently on the old website. Post box collections: Mon-Fri 1545 / Sat 1100. Brandon is at the centre of the Lovedeon Wapentake. 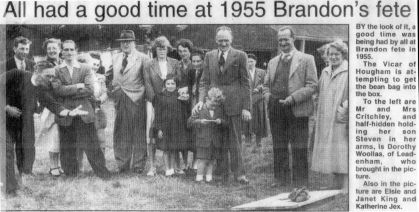 The name of the village may mean ‘hill by the River Brant’, from the Anglo-Saxon names for the river (Brant – steep or deep) and dun (hill), or perhaps a broom-covered hill (Brom Dun). 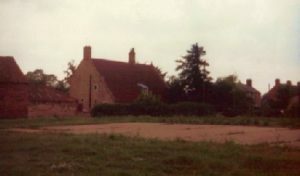 The Manor of Caythorpe, which had been owned by Aelric son of Mergeat in 1066 but in 1086 the lord was Robert de Vessey. In Brandon this manor had 8 freemen and land for 1.4 ploughs. 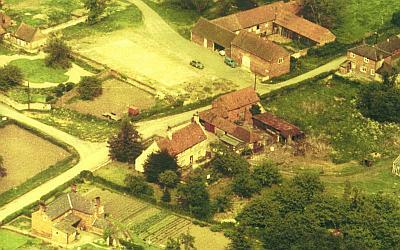 The Manor of Folkingham, had been owned in 1066 by Ulf Fenman. In 1086 Deoring was lord, but the tenant in chief was Gilbert of Ghent. This part of Brandon had 13 freeman, land for 5 ploughs and 6 acres of meadow. Presumably it was the larger part of the village that lay within the soke (juristiction) of Gilbert de Gant of Folkingham (1st Earl of Lincoln) in the 12th century . In the 13th century parts of Gilbert de Gants’ feoffment were held by Ralf de Dryby and the Templars. Later in the 13th century William Bardolf was ‘lord paramount of part of this vill’. Brandon Old Hall dates back to at least 1500, but amongst the stories surrounding the Hall include the tradition that Hereward the Wake (11th century), a knight escaping from the battle of Stoke Field (1487) and the deposed King James II (1688) all stayed there. 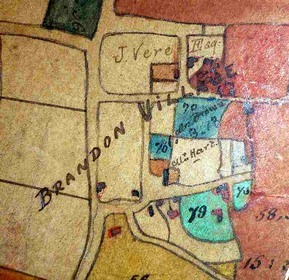 Remains of possible crofts (enclosed land attached to a house) have been identified in the field to the east of the village (know as Old House Close in 1850). 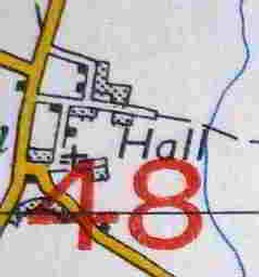 Possible remains of tofts (houses) have been identified to the north of the start of Hall Lane (near the duckpond); this field was called Falcon Yard in 1850. The church at Brandon (actually a ‘chapel of ease’, subsidiary to the parish church at Hough) was originally built in Norman times, although most of the structure is Early English. It was restored in 1872 by 3rd Earl Brownlow, who owned much of the land in the area. We don’t have much other history until Victorian times, but the current field boundaries are likely to date back to the Enclosure Acts (roughly 1750-1850). Greystones has a stone dated 1717 and Brandon Hall was probably built in the mid 1700s. 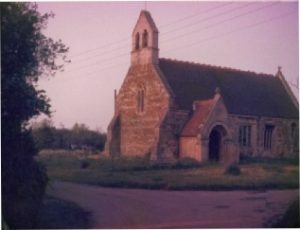 The small Chapel of Ease at Brandon was restored in 1872 by Kirk of Sleaford. The medieval work dates to periods between the 12th and 15th century, while the presence of late Saxon material may indicate the presence of an earlier church or other high status building. There are several re-used windows and a Norman south door. The lintel and tympanum have chip-carved St. Andrews crosses and the hood mould has a motif that is Anglo-Saxon derived. The north arcade is Early English and there are Decorated and Perpendicular features. 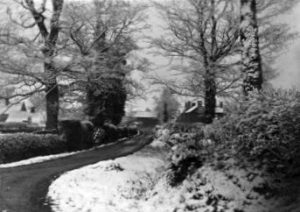 In the late 1940s German POWs were housed in Groom’s Cottage and the attics of Brandon Hall while they worked on the farms. 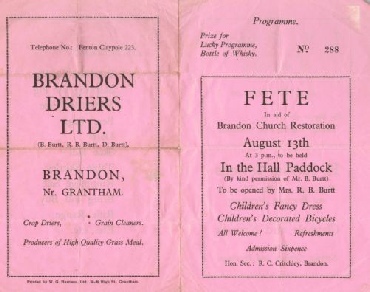 After the war, village fetes were in the field opposite Brandon Hall. 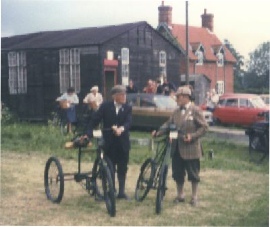 The gate off Hall Road was the entrance, stalls were under the brick shed and there was Bowling for a Pig was on the left in the corner near the gate. 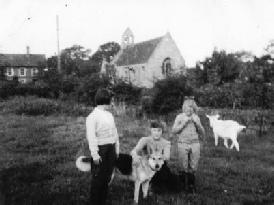 This field had a sheep dip (just behind the shed and slightly to the right) and there was also a pond there which extended into what is now the garden of The Courtyard. In the corner nearest Brandon Hall (and perhaps part of the Courtyard garden) there was a tennis court. 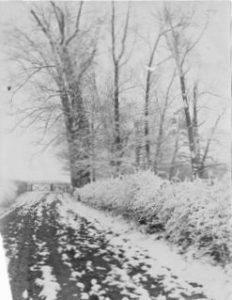 This was used by the whole village and maintained by Mr Jex, the Burtts and the German POWs. 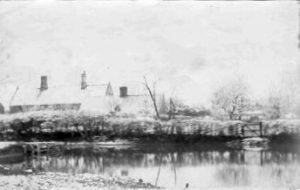 There were whist drives and meetings at the barn next to Greystones, what is now the Granary and the barn opposite Old Hall Barn. 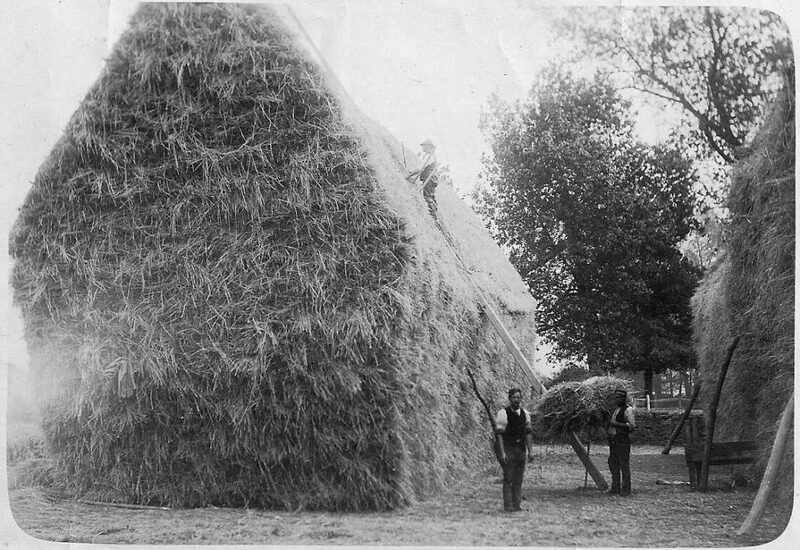 The floor to the latter was raised to about 3ft and it was used for storing hay.